Roland is a recently divorced aging baby boomer now living the life of a spiritual seeker, intellectual, existentialist, and artist who is also secretly battling an incurable disease, as he faces his enigma of navigating the desires of the flesh without corrupting his soul. A man of harsh self-criticism, discipline, and honesty, he is earnestly fearful of being labeled a hypocrite. He is driven with the idealism to assist humanity in distress. 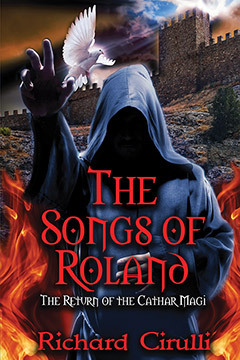 Roland is no fool, or a Don Quixote, rather a moralist who stands up against the injustices of life at all hazards. He is viewed as an avant-garde intellectual philosopher and artist within the arts and academic community, though among his intimate women friends he is known for his spiritualism, sensitivity, honesty, respect for women, and his quest for a higher self - at times viewed as a paradox, an anachronism, and contradiction. Though his profane detractors regard him as a threat and as much an idealistic fool. Roland, raised in a devout Catholic home, begins his spiritual quest in his youth after receiving a series of visions that take him on his arduous path to the western hermetic tradition of Gnosticism, the Kabbalah, and esoteric Freemasonry. Eventually achieving the grade of magi and adept of the illuminati order - a secret he guards jealously, known to just a few confidants. Through a number of synchronistic events, Roland finds himself intimately involved with Candice, one of his former college students. As the relationship grows and Candice moves into his loft, Roland is plagued with a consistent and frequent nightmare of being burnt alive at the stake for being a Christian Heretic in Southern France during the Albigensian Crusade of the 13th century. Roland believes this is an omen for his immoral transgressions, and he will be cursed to burn in the eternal damnation of hell. Before dying Roland is given a heavenly vision that reveals both Candice's and his true identities and missions. Richard Cirulli is a retired professor, now living a spiritual artist's life. He holds two PhDs, a number of masters degrees, and undergraduate degrees in various fields. A former professional student, he is now enjoying life as a bit of a Renaissance man: a playwright, writer, columnist, photographer, poet, artist, guitarist, songwriter, actor and producer. Two of his original plays, "Via Delarosa" and "Roundelay," were recently performed at White Plains Performing Arts and received rave reviews. Richard has been on a spiritual journey since his early childhood when he had his first mystical vision, which opened the portal to his mystical quest. His quest led him to his study and membership into the higher degrees of Freemasonry, the Rosicrucians, The Martinist Order, the Qabalah, Theosophy and Christian Gnosticism, among others. He holds a PhD in Sacred Science from the International College of Esoteric Studies. He is also certified in REIKI, and Nutrition and Herbology. He has written twelve volumes of metaphysical poetry and meditations. Richard has embraced walking the arduous path of wisdom to assist a humanity in distress.